Spartan is a small sweet apple, and a great favourite with children. 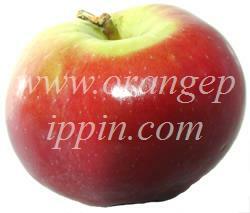 It is very much a "McIntosh" style apple, bright crimson skin and whiter-than-white flesh. We leave ours on the tree as long as possible, until they are crimson all over, as this allows the flavour to develop. Straight from the tree the flesh is very crisp and juicy, but it softens a bit within a week or so of picking - although remaining juicy. This is also a good variety for juicing - the juice colour is not especially remarkable but the flavour is sweet and pleasant. Spartan is an excellent garden apple, being easy to grow, resistant to scab, fairly resistant to mildew, and it crops very reliably - and by growing your own you can enjoy Spartan at its best, straight from the tree. However it can be prone to canker in wetter regions. 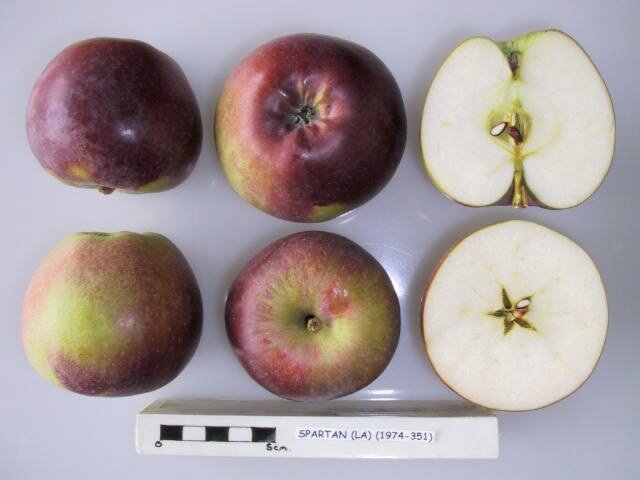 Spartan is a historically interesting apple, being an early example of a variety developed in a formal scientific breeding programme in Canada. It was raised at the Canadian Apple Research Station in Summerland, British Columbia, in the 1920s, and the mother variety is McIntosh (of course). There is some uncertainty over the pollen parent, it is usually thought to be Newtown Pippin. Spartan is also one of the few North American apple varieties that can be grown successfully throughout the UK, where it has long been a popular garden apple variety. If you only have space for one of the McIntosh-style apple varieties in your garden orchard, Spartan is a good choice - straight from the tree on a cold autumn morning, the vinous sugar-rush is hard to beat! I mistakenly ( how does one do that) bought a bag of the Spartan variety apples from.local Costco store. Ok...I am a diehard McIntosh fan; love the hard white flesh and the absolute tartness. The apples are a reasonable medium size ,good red color overall, flesh clear white, juicy,sweet, the taste,for me in the circumstances, I found too much hint of pear ( which is what told me it wasnt the mac I thought). As other eaters/ posters have commented an excellent apple in it's own right and one I am sure children would love. This is probably my favourite eating apple, which surprises me as I normally don't like McIntosh-style apples at all. In fact this is the apple the McIntosh probably wishes it could be - sweet and acid in really good balance with a hint of burnt caramel, almost toffee-apple flavour. Grows well and always gives a good crop. Yuk too sweet and not enough acidity for my taste. The Spartan is by far my favorite apple. I found our stores are carrying so many different varieties of apples but the Spartan is hard to find. WHY? Nothing compares to it! I love this apple! I grow about 8 or 10 different kinds of apples, and this one is ALWAYS the best producer AND the one tree that is the least affected by scab or insects (I only spray minimally). Plus it has the most beautiful fruit while on the tree. An all around winner! Brent - a sweet apple with a crisp bright white flesh. also has a very small core which means more appley goodness for you to enjoy. Just tried my first Spartan. This is March and it was a bit mealy from storage, but the flavor was excellent. Very reminiscent of a Mac--sweet and tart together. Bet it's fantastic right off the tree! I have just eaten one of the tastiest apples out of a Sainsbury family pack, I never thought that I would be so interested to find out what type of apple it was . The Spartan now has my vote for a snack or an addition to a ploughman's lunch. We just bought our tree last week and planted it. Hopefully next year it will bear fruit. My Spartan remain very healthy and completely pest and disease-free (Eastern UK) despite the claims that they are supposed to be prone to canker or other diseases - but perhaps that will come as the trees age. The tree itself is about medium vigour or perhaps slightly less than medium if allowed to crop heavily at a young age - which can happen because it is quite precocious and fertile. The fruit is remarkably free from pest or fungal damage, although if the skin (which is quite thick and has a yeasty "bloom") is broken, the fruits succumb surprisingly quickly to brown rot. With us having an unusually warm spring followed by an unusually cool summer, the fruits have been of inferior quality this year; developing the notorious "metallic" and "woody" taste (woody as in the taste when you lick your ice-lolly stick) which can happen occasionally. In most years, the Spartan fruit produced here is good, and palatable to most people; fairly sweet and juicy, with hints of melon and strawberry. Fruit tends to lose its quality after a few months of storage - tasting fermented and losing its texture, although, like Red Delicious, can still look excellent on the outside. I purchased some of these the other day from a farmers market, who come to our local town once a month. This is the first time that I have tried them and they were recommended and I must admit they were absolutely gorgeous. I have a family apple tree where Spartan is the dominant apple. It is usually a prolific flowerer/fruiter with the odd year off for recuperation. Although the apple is good, every year I lose most of the crop due to a worm parasite which seems to burrow into virtually evey apple on the tree. For this reason, most of the apples end up in pies or discarded. My neighbour has one in his garden and it fruits well and is resistent to the typical Pacific Northwest crop of diseases. Tastey too. spartan its very good apple variety. Have 4 spartan in my garden. Oldest one is now 5 years,fruiting well,cover with netting to prevent attacks by birds,(they are not having MY spartan)!!!!! What a great apple,picked one or two this morning for eating latter in day.Question, Do they store? ALOHA ~~ EXCELLENT APPLE. RAISED IN RHODE ISLAND, OLDEST OF SIX, ONE OF MANY FAMILY TRADITIONS WAS THE HAPPY WEEKEND TREK TO THE RI COUNTRYSIDE FOR A BUSHEL OF McINTOSH APPLES. LIVING IN HONOLULU NOW FOR 20 YRS, SPARTANS ARE REALLY THE CLOSEST I'VE EVER GOTTEN TO THE TASTE OF MY BELOVED McINTOSH. Inherited this apple tree and over the years it has yielded a lot of fruit - never tasted an apple so good - bumper crop this year so brought apples into work - everyone raved about the taste,colour,texture etc yummee OP: Yes, this is an easy apple to grow, and great straight from the tree. This apple has the best taste for cooking or eating and I would like to grow my own tree's, but cannot find where to buy them in Clallam County? We like spartans very much but it seems to be a very short season. We've found them in Waitrose and Sainsbury's. Is it possible to buy a box from an English grower? OP: Yes, Spartans are great straight from the tree, but don't really keep. Every year we pick apples at a friend's orchard, but we never knew what they were until we had them identified at the apple day at the botanical gardens last week end. The ones we love, aka "the purple ones", as my children call them, were identified as Spartan, but they are almost plum colour, with white flesh tinted pink in places, and not as squashed in shape as the one in your photo. Nothing like it really...anyway we absolutely adore them, eat them every day and have made quite a lot of juice. The others, which we also like but not as much, are Queen cox and Crispin Mutsu - these were probably ready a bit earlier and have gone a bit soft, but the taste is quite nice. We also picked some Howgate Wonder for baking, and they are nice and sharp, but I quite like to eat them raw too! Orangeippin: yes, Spartan can go very deep crimson/purple if left on the tree as late as possible. My first experience of a Spartan apple, and its certianly a good one. Seems to be available in Waitrose at the moment - at least until I buy them all! I have just had the apples growing in our garden identified as Spartans. I love the way they have a whitish bloom on the skin until you polish them, then they glow deep red, much darker than the picture above. They make a wonderful sunset coloured apple juice, keep well when stored - altogether, a great apple! I recently went apple picking in Washington CT Averill Farm. I picked all Spartan apples, they are the BEST so far!! I grow Spartan apples in my back garden. This year was an exceptional crop. One medium tree yielded nearly 200 kg of the little gems, which I shall shortly be pressing to make some Spartan Cider! I love the spartan apple, but I haven't been able to find them in a long time, I finally got some at an Amish roadside stand I frequent near my home. I ate one on the way home and couldn't get over how good it was, I'm going back to get some more. Bought 3 of these. My children hated them! I however adored them as they brought back memories of my childhood. No idea why. Will buy them again. Roger Macpherson in Delta, B.C. Fruit colour: Red Becomes purple / maroon when fully ripe. Fertility: Partially self-fertile Effectively self-fertile, but crops better with a polllinator. Rated as resistant - control only needed under high disease pressure.